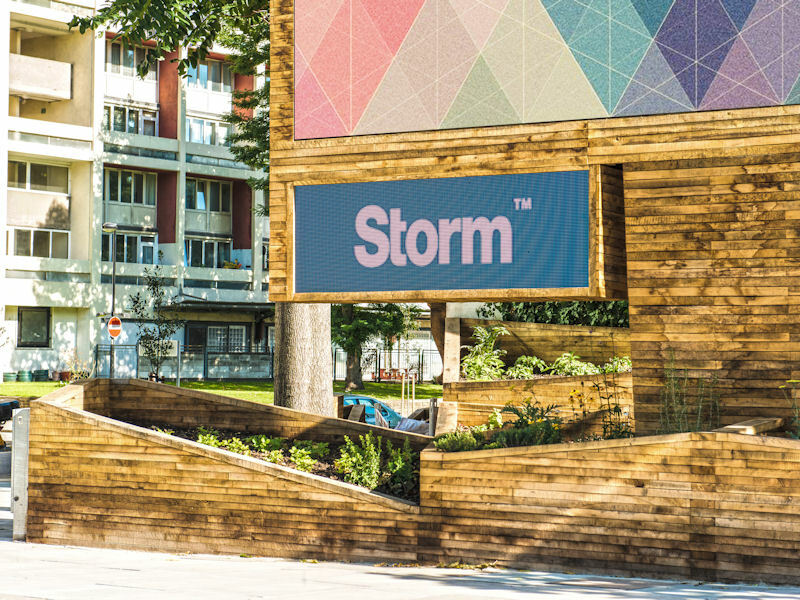 A new hybrid advertising space and community garden, designed by Wildstone for client Clear Channel’s premium Storm brand, has transformed a treacherous corner in London into a vibrant community space. Wildstone were instructed by Clear Channel on a number of their existing advertising sites with a view to upgrading them to a modern digital format and establishing the "Storm" brand as a network of premium digital advertising sites. One such site was located at the corner of a 1.8ha Council owned development site which has been derelict for over 20 years. 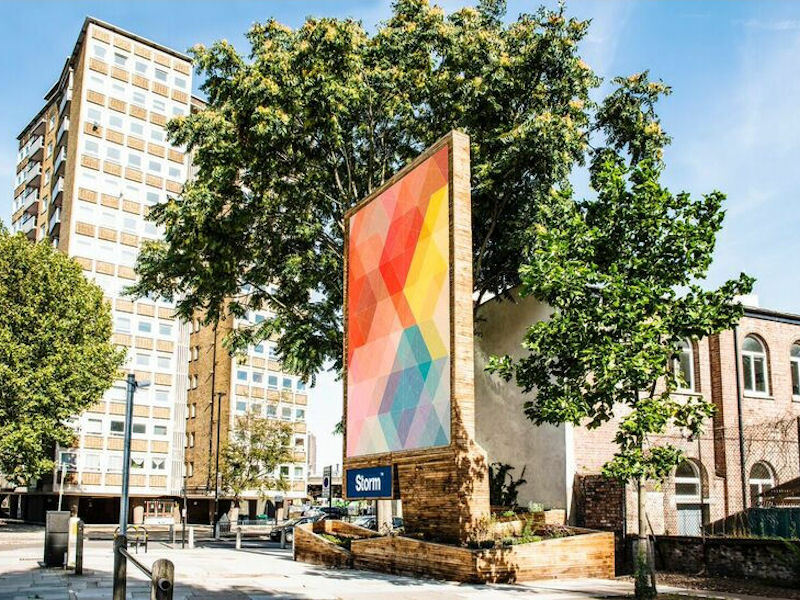 The brief from Clear Channel was to deliver a 5m x 7.5m digital display and to improve the boundary treatment of the site to address site security issues which had led to regular reports of antisocial behaviour. Wildstone were appointed due to their design led approach as the site was to form part of the "Storm" branded premium digital advertising sites. The size of the main display was set by the client from the outset and it was agreed that the second display on the site could be removed to assist with the planning negotiations. At pre-application stage the Council's Planners suggested that a like for like replacement of the main display may be acceptable, but suggested that the site should remain temporary looking, as the land formed part of a wider development site. The client was under pressure to provide a more secure solution to the site due to regular reports of trespass and antisocial behaviour from the Council's Community Safety team. The wider development site had recently secured temporary uses for a workspace project and a charity run community hub and the new tenants were also very keen to see an end to the antisocial behaviour on the site. The application proposal retained the main advertisement in exactly the same position but removed the boundary fencing to open up the site and remove hiding places. 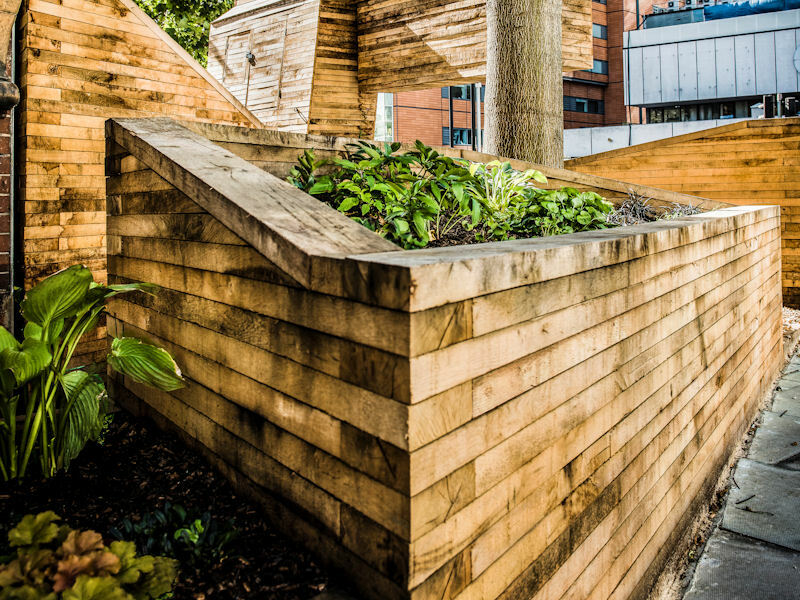 The space was filled with interlocking wooden planters arranged to fit around the mature tree on the site. The tree was to form a major part of the final scheme via inclusion within the lighting design. The wooden planters were offered to the neighbouring community hub as this included a community gardening initiative. Following discussion with the surrounding tenants the design was further amended to include a pathway to the rear of the display. The wooden planters and the retention of the mature tree set the tone for the scheme and the digital display itself was clad and framed with the same type of wood. 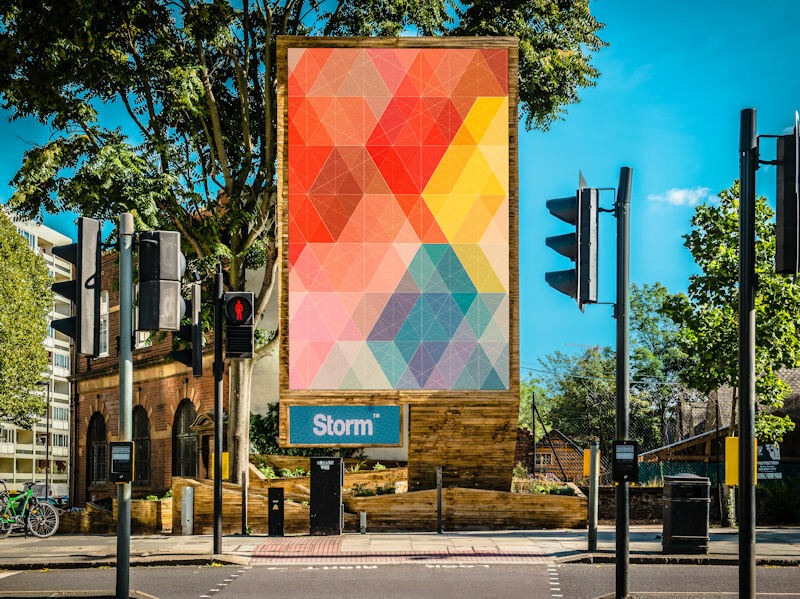 Wildstone have worked closely with Clear Channel on a number of their "Storm" sites including at Chiswick Roundabout, Hammersmith flyover, Staples Corner and Billingsgate Fish Market. 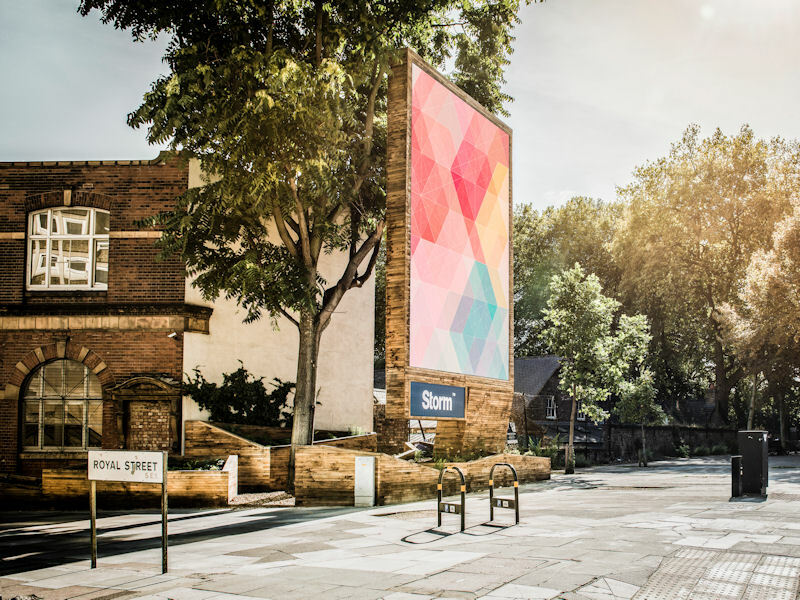 We have also had experience of collaborative community led advertising developments at Somerstown in Camden and Shoreditch although both of these proposals have been frustrated by reasons beyond our control. The structure is made up of a series of modular interlocking wooden crates that do not require foundations and will be simple to remove in future if the site is developed. The crates are set at sharp angles to one another to make them visually appealing whilst also providing a platform for the signage. The sign itself is in the same position as the one it replaced, but the supporting structure is now cantilevered to create a greater sense of openness. The frame and rear of the display has been clad in the same sustainably sourced oak timber as the crates below, seamlessly tying together the design and linking it to an existing tree which has been retained as a feature and backdrop to the signage. Along with the rest of the site, the tree will be accentuated with lighting that will pick up colours from the content displayed on the screens, illuminating the surroundings in a subtle and playful lightshow. Council officers did not support the proposal initially as it was argued that the replacement of the displays might increase their prominence even though the scheme retained the same size, location and orientation of the displays. The application was refused on this basis and the applicant took it to appeal. The Planning Inspectorate allowed the appeal, with the Inspector siding with the appellant and describing the landscaping as a "marked improvement". The series of modular interlocking wooden crates which make up the community garden and the unique wooden cladding to the modern display. Wildstone have created a scheme to change this crime ridden space by transforming it into a publically open, working community garden, whilst reinstating the site's original function as an advertising space. 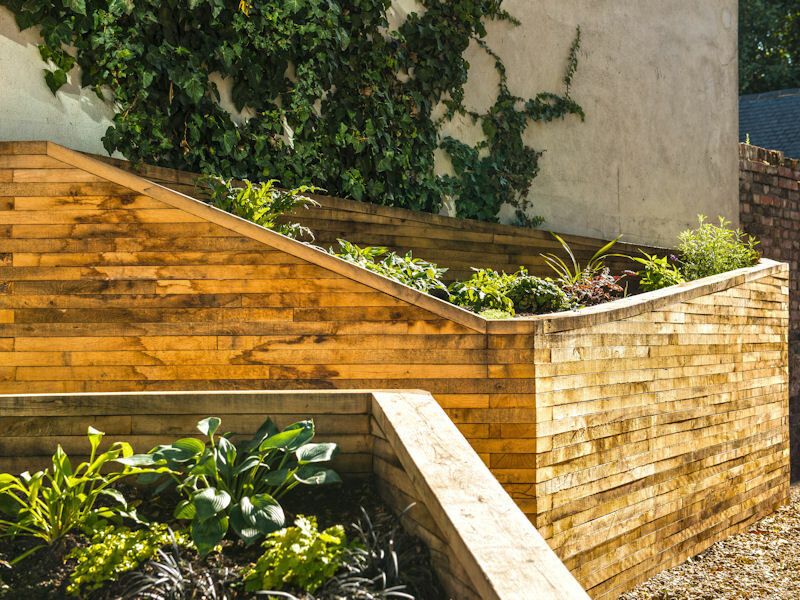 Instead of merely screening the unsightly development site, which is what past billboards have tried to do, Wildstone's design solution proposed attractive landscaping using wooden crates that create terraces of planters for growing food and flowers. By opening up the site, Wildstone's design proactively engages local residents - and a homeless man previously living behind the hoarding - to tend the vegetable plot. Wildstone's urban intervention demonstrates the benefit of using a design-led approach to upgrading advertising sites. The regeneration of a redundant and crime ridden space has not only increased the value of the site, but is benefitting the local community through its sensitive and well-considered design. Neil Haggertay, Area Crime Reduction Officer at Lambeth Council said: "I supported the re-development of the site from the beginning as it was a key site for anti-social behaviour and crime. The new look gardens and signage has improved the area and eliminated the vast majority of the issues previously faced. It is without doubt a major success story."